Marfan syndrome (MFS) is an autosomal dominant connective tissue disorder caused by mutations in the FBN1 gene. Approximately 90% of classic MFS patients have a FBN1 mutation that can be identified by single-gene sequencing or gene-panel sequencing targeting FBN1. However, a small proportion of MFS patients carry a large genomic deletion in FBN1, which cannot be detected by routine sequencing. Here, we performed an MLPA (multiplex ligation-dependent probe amplification) test to detect large deletions and/or duplications in FBN1 and TGFBR2 in 115 unrelated Chinese patients with suspected MFS or early-onset aneurysm/dissection. 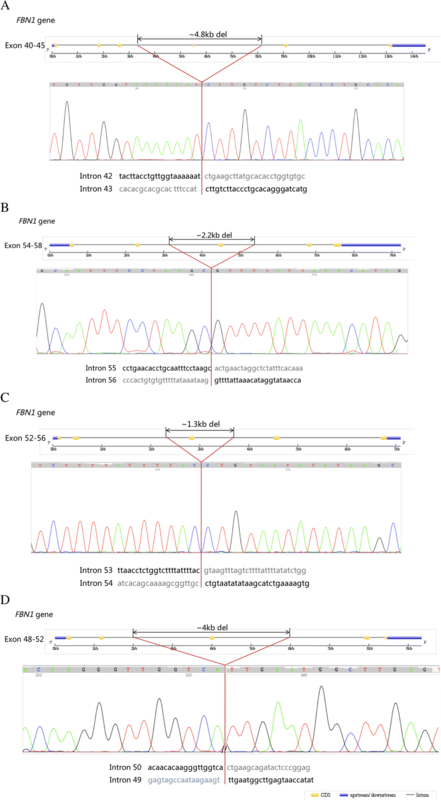 Five novel large deletions encompassing a single exon or multiple exons in the FBN1 gene were characterized in five unrelated patients, of which four were proven by Sanger sequencing, and the breakpoints were identified. Three of them met the revised Ghent criteria when genetic results were not available, and the other two patients were highly suspected and diagnosed with MFS until the FBN1 deletions were identified. Our finding expands the mutation spectrum of large FBN1 deletions and emphasizes the importance of screening for large FBN1 deletions in clinical genetic testing, especially for those with classic Marfan phenotype. Marfan syndrome (MFS) is a connective tissue disorder with high clinical heterogeneity, mainly involving ocular, skeletal, and cardiovascular systems, with an estimated prevalence of 1:3000–1:5000 . A large proportion of patients have visible signs, such as tall and slender stature, arachnodactyly, chest deformity, and scoliosis. Most patients have rapidly progressive myopia, and approximately 60% of affected individuals have ectopia lentis. However, cardiovascular abnormality might be the only defect in some MFS patients that is insidious and fatal. MFS is caused by mutations in the FBN1 gene, which is located on chromosome 15q21.1 and encodes a 320-kDa extracellular matrix glycoprotein fibrillin-1 [2, 3], a major component of microfibrils. So far, more than 2500 mutations (HGMD Professional 2018.1 total) have been identified throughout FBN1, while missense mutations are the most common type [4, 5]. Sanger sequencing of FBN1 and panel sequencing including FBN1 as well as a number of other genes associated with inherited aortopathies are commonly used to identify mutations ; however, both of these methods have a limitation for detecting FBN1 large deletions (del) or duplications (dup), which have been reported in up to 7% of MFS patients . Additionally, Loeys-Dietz syndrome (LDS), another inherited connective tissue disorder, which is caused mostly by TGFBR1 and TGFBR2 mutations, is often clinically indistinguishable from MFS . However, up to now, no large genomic rearrangements in TGFBR1 or TGFBR2 have been reported in patients with aortic aneurysm/dissection and LDS features. In this study, we performed a multiplex ligation-dependent probe amplification (MLPA) testing of FBN1 and TGFBR2 in 115 unrelated Marfan or early-onset aortopathy patients that were previously proven to be negative in a panel testing involving 15 genes associated with inherited aortopathy. A total of 115 patients with suspected MFS or early-onset aortic aneurysm/dissection, who had a negative result in a 15-gene panel testing, were included in this study and evaluated for gross deletions and duplications in FBN1 and TGFBR2 gene by MLPA assay. The baseline clinical characteristics are summarized in Table 1. Of all patients, 19 were classic MFS, which referred to those who met the Ghent criteria independent of genetic results, and 43 were suspected MFS, which referred to those with some positive signs (either aortic dilation or positive family history AND systemic score ≥ 3) but not meeting the criteria yet. Almost half of the patients had no other systemic abnormality except for aortic events. Five novel large deletions encompassing a single exon or multiple exons in the FBN1 gene were identified in five unrelated patients (Fig. 1, Table 2). Patients AD234, AD392, AD533-1, and AD680-1 harbored FBN1 deletions of exon 43, exon 56, exon 54, and exon 50, respectively, while patient AD437 had a large deletion encompassing exons 44–66 in FBN1. These data had been submitted to ClinVar (ClinVar accessions SCV000804313-000804317). To detect the breakpoints of deletions, we performed a long-range PCR followed by Sanger sequencing. Finally, the four single-exon deletions were all confirmed, and the breakpoints were found (Fig. 2). Regrettably, the deletion in AD437 could not be verified by the same method, since the mutated allele did not amplify well. Hence, we performed a quantitative PCR instead. Figure 3 shows that the quantity of genomic DNA from the proband amplified by primer pairs targeting exon 55 and exon 66 was half of that in the control samples, suggesting the true presence of a heterozygous deletion in this region. All five FBN1 large deletion carriers had multiple system deformities. Information on the clinical manifestation of the disease and family history is summarized in Table 3. Three patients (AD234, AD392, and AD437) were classic MFS, while the other two (AD533-1 and AD680-1) both had a systemic score of 6 but did not meet the criteria yet when genetic results were not available, probably due to their young ages. Combined with genetic results, these two patients were eventually diagnosed with MFS. 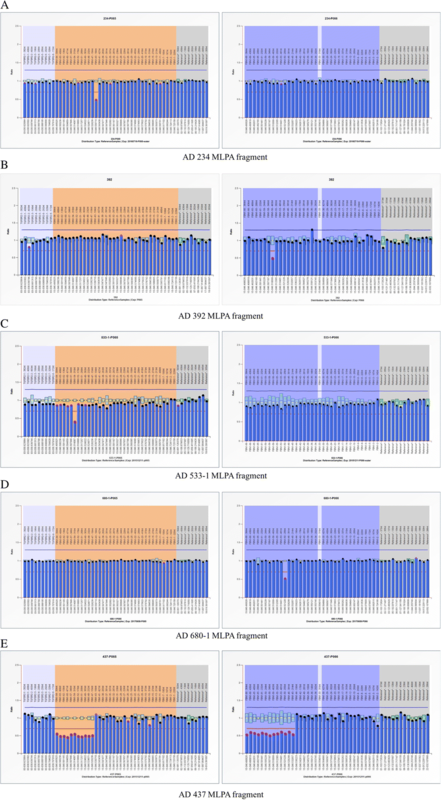 Notably, patient AD437 had a gross deletion involving the last 23 exons, but there was no significant difference in the severity of clinical phenotypes when compared with the other four single-exon deletion carriers. Marfan syndrome has a highly variable manifestation, from a mild phenotype to early-onset and rapidly progressive MFS. Cardiovascular abnormality could be the only defect in some affected individuals. According to the 2010 revised Ghent criteria, in the absence of family history, the combination of aortic root dilation (Z ≥ 2)/dissection and identification of a causal FBN1 mutation was sufficient to establish a diagnosis of MFS . Accordingly, we performed an MLPA assay to screen for FBN1 and TGFBR2 large genomic rearrangements not only in the diagnosed/suspected MFS patients but also in those early-onset aneurysm/dissection patients with minor skeletal and ocular involvement, who had a negative result in a 15-gene panel testing associated with heritable aortopathy. Finally, five patients with large FBN1 deletions were identified in our cohort. All five patients had multiple systemic deformities, and three of them met the 2010 Ghent criteria when genetic results were not available, while the other two met the diagnostic criteria until FBN1 gross deletions were detected, probably due to their young ages. Meanwhile, no gross deletions/duplications were identified in patients with only aortic aneurysm/dissection but without other systemic involvement. This result supported the hypothesis that FBN1 gross deletions usually lead to classic MFS [10–12]. Although gross genomic rearrangement within the FBN1 gene only contributed to a small proportion of MFS genetic causes (1.8–2.9%) (UMD, http://www.umd.be/FBN1/; HGMD, http://www.hgmd.cf.ac.uk/ac/gene.php?gene=FBN1), it was important to identify the pathogenic mutation to afford the patient an opportunity for prenatal testing and preimplantation genetic diagnosis (PGD). FBN1 mutations could be identified by sequencing in most Marfan patients (up to 93% in classic Marfan patients) . However, Sanger sequencing and next-generation sequencing are commonly used in clinical genetic testing and are limited in their ability to detect large deletions and duplications. MLPA is a commonly used method to screen large del/dup, commercially, easily, and rapidly. In our cohort, 5 out of 62 patients (8.1%) with diagnosed or suspected MFS but with negative results in panel sequencing had large FBN1 deletions, which proved it to be efficacious and cost-effective to screen for FBN1 large genomic rearrangement in those MFS patients with multiple systemic involvements and a negative FBN1 sequencing result. Since MLPA and SNP (single-nucleotide polymorphism) arrays are more applicable in clinical genetic testing, increasing gross FBN1 genomic deletions/duplications has been reported (summarized in Table 4), but until now, there has been no definite and conclusive genotype-phenotype correlation. 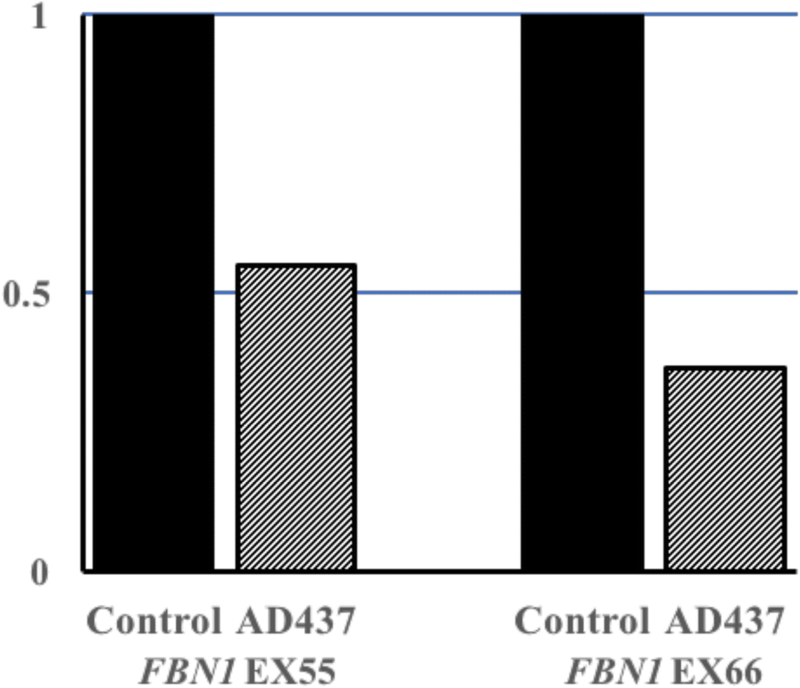 Current studies reveal that the whole gene deletion of FBN1 did not lead to a more severe phenotype , and in-frame deletion involving exon 24–53 seemed to result in a high risk of early-onset and rapidly progressive form of MFS [11, 14–16]. In summary, our data expand the number of large FBN1 deletions and emphasize that screening for gross deletions in FBN1 genes is necessary for clinically suspected MFS patients, especially in those who have a negative result in conventional sequencing methods. Patients with MFS or early-onset aortopathy were referred for a genetic test from the Center of Vascular Surgery in Fuwai Hospital and Department of Cardiovascular Surgery in Xiangya Hospital Central South University. Of these, 115 patients in whom no causal mutation was identified in a 15-gene panel associated with heritable aortopathy, including ACTA2, CLO3A1, FBN1, FBN2, MYH11, MYLK, NOTCH1, PRKG1, SKI, SLC2A10, SMAD3, SMAD4, TGFB2, TGFBR1, and TGFBR2, were enrolled in this study to screen for FBN1 and TGFBR2 large del/dup. MLPA assays were performed to detect FBN1 and TGFBR2 large deletions or duplications using the commercially available SALSA MLPA kits P065 and P066 (MRC-Holland, Amsterdam, The Netherlands), which contained probes for all exons of FBN1 and TGFBR2. According to the manufacturer’s instructions, a total of 100–200 ng of genomic DNA of each patient was used for hybridization, and amplification products from each MLPA assay were separated by capillary electrophoresis on an ABI 3500XL Dx Genetic Analyzer (Life Technologies, USA). The results were analyzed using Coffalyser software. Deletions and duplications with deviations more than 30% were suspected as significant alterations. To verify the results of MLPA and identify the breakpoints of the deletions, we performed a long-range PCR and subsequent Sanger sequencing. Primers flanking the predicted deletions were designed and LA Taq Hot Start Version kit (Takara, Japan) was used in the PCR system with the following cycling process: 5-min initial denaturation at 96 °C, 30 cycles of 10 s at 98 °C, and 15 min at 68 °C, finished by a 10-min final extension step at 72 °C. Then, the products were detected through agarose gel electrophoresis and sequenced by the inner primers on the ABI 3730XL Genetic Analyzer. Quantitative PCR (qPCR) with the SYBR green reporter dye was performed to quantify relative target gene regions copy number in genomic DNA, and housekeeping gene GAPDH (glyceraldehyde 3-phosphate dehydrogenase) was used as the reference gene. The primer pairs were designed by Primer3 Input (http://bioinfo.ut.ee/primer3-0.4.0/) (see Additional file 1). All qPCRs were performed using 2 × SYBR FAST qPCR Kit Master Mix (KAPA Biosystems, America) with the QuantStudio 6 Flex Real-Time PCR System. Hang Yang and Yanyun Ma contributed equally to this work. We thanked all the subjects who participated in this study. This work was supported by the grant of CAMS Initiative for Innovative Medicine (2016-I2M-1-016) and the grant from the Youth Foundation of Fuwai Hospital, National Center for Cardiovascular Disease, China (NO. 2016-F05). HY coordinated the project and wrote the manuscript. YM and KZ performed MLPA and quantitative PCR. ML, XS, and FL recruited patients and collected clinical information. YZ and GZ were in charge of sample handling and quality control. LW and CS were in charge of the clinical evaluation and sample management. ZZ designed the project and revised the manuscript. All authors had read and approved the final manuscript. Everyone accepting the genetic test was adequately informed and signed a consent form. The study was approved by the ethics committee of Fuwai Hospital (Approval No. 2017-877) and adhered to the Declaration of Helsinki. Everyone accepting the genetic test signed a consent form and agreed to allow their anonymized samples and genetic results to be used for further research studies and publications.